Evidence-based practice (EBP) is the new Holy Grail of social work. We are not here to dispute that, although we believe that the movement has some limitations, particularly in terms of implementation. In the end, after all, what good alternative is there to using interventions backed up by the best available evidence of effectiveness? We don’t know of any. Instead, the purpose of this book is to elaborate on what we believe to be the most important step of evidence-based practice (or any kind of practice, for that matter), that of documenting that any intervention we use, irrespective of the evidence that it has been effective with others in the past, helps this particular client move toward his or her goals right now. The focus in this book then is not the specific interventions you employ, but the outcomes experienced by your clients. We call this approach “outcome-informed practice” (though we do not claim to have coined that term). This book is intended for social workers and other practitioners (as well as students) who have had at least a basic foundation course in research and some familiarity with evidence-based practice. On the other hand, if you are practicing or studying social work or another helping profession and you do not feel comfortable with basic research and evidence-based practice, you may still find this book useful. We provide an extensive glossary for terminology you don’t recognize, and we offer that glossary as well as other helpful resources in our companion website for this book, URL. We also provide a number of recommended readings for anyone who wants more detail on the issues we describe in each chapter. A major problem with writing a book is that it is necessarily linear; you can’t talk about everything at once, and it often seems that you need to discuss each issue before you can discuss all the other issues! Forgive us if you find yourself thumbing back and forth among chapters, but that is the nature of knowledge: it’s all connected. Some people may find our organization unusual; we do not begin with definitions and discussions of measurement designs and how to implement them, as many authors on this topic have done. We feel that your understanding will be enhanced by first reading about how the basic concepts and processes are used in practice, so we present case examples and illustrate the critical thought involved in each step of intervention. If this doesn’t turn out to be true for you (and we’re all about individualized approaches! ), use the table of contents to read in the order that works for you. 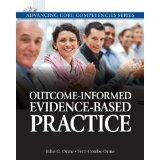 In chapter 1 we present two cases that illustrate how outcome-informed, evidence-based practice works in the real world. One case involves a foster child and her family, a classic area for social work practice and one that is complex and sometimes messy. The other case involves a Saudi Muslim university student whose depression is related to adjusting to a new culture. Both cases demonstrate the challenges of the continuous decision-making that goes into good social work practice and how monitoring client outcomes can guide you to make the best decisions at each step in working with a client. You will see cases in nearly all of the other chapters as well, integrating the concepts of outcome-informed practice, some compilations from our experience and some wholly imagined. We aim to provide enough detail to illustrate the important principles in these case examples, but it is obviously not possible to present all of the myriad of facts that are important to any case. Whereas you may see clients meet their goals in five weeks in the cases we present here, we know that most cases require more time and may involve a series of stops and starts. We hope you will accept these limitations and see our companion web page for richer, more lengthy, and perhaps more realistic, examples. Chapter 2 deconstructs the overall process you see in the cases in chapter 1, as we provide important definitions and descriptions of outcome-informed practice. You will see quite a bit here about evidence-based practice (EBP) as well, since that is arguably the focus of social work practice and education now. While we describe outcome-informed practice in the context of EBP, we believe that outcome-informed practice can be useful to you if you have not jumped on the EBP bandwagon. See what you think. Given that most practitioners do not monitor client outcomes consistently as a means of guiding their practice, we think it’s only fair that in chapter 3 we answer the question “Why would someone do that?” Evidence-based practice, or indeed any kind of social work, psychology, or other practice is time-consuming and complicated. Why are we giving you one more thing to think about? We hope you will see why and agree with us about the importance of monitoring your clients’ outcomes after you read chapter 3, if you do not already. The reasons are compelling and go to the heart of the profession. Chapter 4 discusses assessment, a complex process that involves both science and art, we believe. Volumes have been written about conducting good assessments, and we find valuable information in nearly every account we read. (We do not pretend to present here the final word on this difficult topic.) Our discussion emphasizes details that contribute to an assessment that provides the foundation for careful monitoring of client outcomes. We do not discount the qualitative data that should be considered in every good assessment (e.g., Client is disheveled and shows evidence of poor hygiene; client has difficulty maintaining eye contact; client smells of alcohol and slurs her words, and so on). Years of experience probably make you more sensitive to these qualitative data (if you are paying attention! ), and they are valuable for your understanding of your clients. These important qualitative data should be integrated, however, with data that are as objective as possible, and sifted through a lens of critical thinking. The combination should provide the tools you need to conduct an assessment that will help your clients achieve their goals. Chapter 5 provides instructions and guidelines for constructing graphs using your clients’ monitoring data. This is not just a fun exercise (though we really enjoy doing it); a well-made graph communicates what is happening in your work with your client in ways that are highly informative (not just for you and your client, but also for your supervisor and other relevant parties) and possibly inspiring for your client. Good graphs are tools for effective practice; the templates described here and available for download on our website will be valuable in your practice. Except in the most fortunate of circumstances, however, just producing great graphs won’t get you where you want to go, so in chapter 6 we discuss the intricacies of visually analyzing and interpreting your graphs. Again, critical thinking is required to use all your data, including your graphs of client outcomes, to make appropriate decisions: Continue the intervention as is? Modify the intervention some around the edges? Throw it out and start over with another intervention altogether? Even if you are not aware of it, you make these decisions every time you see a client. This chapter provides the tools to make those decisions deliberately and with as little bias and confusion as possible. Chapter 7 is bit technical, but it’s worth hanging in there to understand it. The design you select for testing your intervention (for that is what you are doing every time you implement an intervention), and the critical thinking you use with it, are instrumental for determining how your intervention is going and the extent to which you can attribute change to that intervention. This is not just an abstract notion you talk about in research class; it’s directly applicable to whether your client meets her goals while working with you. Using the appropriate design, and interpreting your findings correctly, are also part of your ongoing learning as a practitioner because they provide ongoing feedback to you about your work. Take advantage of that feedback. In chapter 8 we present foundation knowledge about measurement that you need for judging the information you use for making decisions with your clients. Knowledge is produced by humans, and there’s no doubt that we will always “see through a glass darkly.” But the principles in this chapter should help you select and construct the best measures, use them appropriately to enhance their value, understand and weigh the weaknesses and strengths of your information, interpret the data you have about your clients, and integrate what you know to make the best decisions for and with your clients. Chapter 9 discusses standardized measures, which are readily available and useful tools for practice. Again, however, critical thinking must be used in the selection and interpretation of the information you obtain from standardized measures. This chapter also discusses considerations of culture and ethnicity in the selection and use of standardized measures. In chapter 10 we describe individualized rating scales. These are measures that you and your client construct together to measure your client’s unique perspective on his or her outcomes. While critical thought and careful procedures are required to construct and use the data from individualized rating scales, there is no substitute for such measures, and they can be critical in monitoring your client’s achievement of his or her goals. In chapter 11 we discuss direct observation of client behavior as a way of collecting data and monitoring client outcomes. One of the many advantages of behavior observation is that it taps directly into client outcomes: e.g., how many times per day does a child disrupt the class with his off-task behavior? It isn’t that a measure of his teacher’s frustration with his behavior isn’t also important, but there is no substitute for the insights we can gain from a direct measure of behavior. In fact, as the case in this chapter illustrates, sometimes direct observation of the client suggests that the problem is not as serious or as pervasive as it has been perceived to be. More precise information is always better (or as one of our favorite fictional characters always says, “Knowing is always better than not knowing”). The final chapter involves many of the same principles and issues as chapter 11, but it concerns self-monitoring, wherein clients record aspects of their own behavior in real time. As a part of the whole package of data you have about your clients and their progress, self-monitoring data have no substitute.